On September 15, 1968, Commissioner Pete Rozelle and Ohio Governor James Rhodes were among 25,049 fans in attendance at Nippert Stadium to see the first regular season home game of the second (and last) American Football League expansion franchise, the Cincinnati Bengals. The Bengals had opened the season a week earlier on a Friday night in San Diego and lost to the Chargers, 29-13. 60-year-old Paul Brown was returning to pro football as a part-owner of the new franchise, as well as head coach and general manager, following a five-year hiatus after being summarily fired from the Cleveland Browns, the team he had coached with much success from 1946 through ’62. He chose to build the new team with younger players. 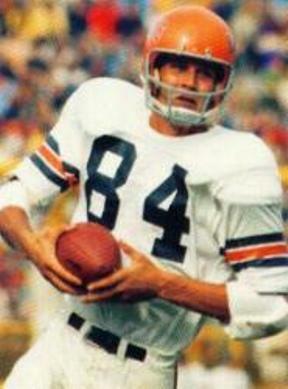 QB John Stofa, a raw talent obtained from the Miami Dolphins and center Bob Johnson, the first draft choice out of Tennessee, were joined by other rookies on offense that included Arizona HB Paul Robinson and TE Bob Trumpy out of Utah (pictured above). More experienced help had been acquired for the defense, including LB Frank Buncom from the Chargers and two ex-Chiefs, LB Sherrill Headrick and safety Bobby Hunt. The team they were hosting, the Denver Broncos, was opening the regular season after coming off a 3-11 year in 1967, the first under Head Coach/GM Lou Saban. The Broncos were in transition, with the most recognizable name on the roster being HB Floyd Little, in his second year out of Syracuse. The first half was scoreless, with neither team able to get inside the opponent’s 19 yard line. Denver’s deepest penetration came to nothing when safety Jess Phillips intercepted QB John McCormick’s pass at the Bengals’ eight yard line. 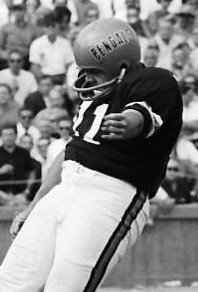 Bob Humphreys missed two field goal attempts for the Broncos and Dale Livingston failed on one for Cincinnati. Livingston (pictured at left), who handled the punting as well as placekicking for the Bengals, was more effective punting the ball and kept the Broncos from gaining good field position while the offense sputtered. He had three straight 52 yard kicks in the second quarter that the Broncos returned for a total of 12 yards. The Broncos outgained the Bengals in the first half, 118 yards to 64. John Stofa completed just 6 of 13 passes, but was victimized by well-thrown balls that were dropped. Following the second half kickoff, the Bengals drove 38 yards in seven plays and Livingston kicked a 49-yard field goal for the first points of the contest. Three minutes later, and on the second play of Cincinnati’s next possession, Stofa threw to a leaping Bob Trumpy, who gathered in the slightly-underthrown ball at the 20, outmaneuvered DB Harold Lewis, and proceeded to the end zone to complete the 58-yard scoring play. But with the Bengals ahead by 10-0, the momentum swung back to the visitors. 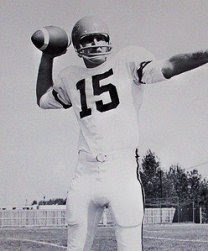 The Broncos replaced starting quarterback John McCormick with Jim LeClair in the second half, and LeClair was effective, moving the team into position for a 33-yard field goal by Humphreys. LeClair led the Broncos on another drive that commenced late in the third quarter and led to a score three minutes into the final period. Denver went 57 yards, helped by LeClair’s passing and the running of Little, capped by the second-year quarterback tossing a five-yard pass to WR Eric Crabtree for a touchdown. The key series came with the score tied at 10-10 in the fourth quarter. On a second-and-ten play, Stofa threw a screen pass to Paul Robinson that was inches short of a first down. On the next play, FB Tom Smiley ran off tackle and was brought down still short of a first down. With the ball on the Cincinnati 46, it was fourth-and-inches and the crowd was chanting for the home team to go for it. Paul Brown gave the go-ahead, and Smiley hit the line and appeared to be stopped short once more but, following a measurement, the officials signaled first down. On the next play, Stofa threw long to rookie split end Warren McVea for a 54-yard touchdown. Backup HB Essex Johnson clinched the game at just under three minutes to go with a 34-yard run down the middle and the Bengals came away winners of their inaugural home game by a 24-10 tally. Cincinnati outgained the Broncos (289 yards to 199) although Denver led in first downs (15 to 11). The Bengals didn’t turn the ball over at all, while the Broncos suffered an interception. John Stofa (pictured at right) completed 12 of 22 passes for 224 yards and two touchdowns with, of course, none intercepted. Bob Trumpy caught 4 passes for 114 yards and the one long TD while Warren McVea hauled in three receptions for 84 yards and a score. With the long touchdown run, Essex Johnson was the team’s leading rusher, gaining 49 yards on five carries. Tom Smiley ran the ball 12 times for 28 yards and Paul Robinson gained 27 yards on his 10 attempts. For the Broncos, John McCormick was successful on just 8 of 19 passes for 89 yards with one intercepted; Jim LeClair threw 6 completions in 12 attempts for 82 yards and one TD. Split end Al Denson caught 8 passes for 115 yards but suffered a broken collar bone in the fourth quarter and was lost for nearly half of the season. Floyd Little ran for 30 yards on 13 carries and gained 32 more yards on two catches out of the backfield. Cincinnati made it two in a row with a win over Buffalo the next week, but had only one more victory the rest of the way to finish at the bottom of the Western Division with a 3-11 record. Denver was just ahead of the Bengals at 5-9. While John Stofa proved to be something of a disappointment at quarterback, the running game ranked second in the league in yards per carry (4.3). Paul Robinson topped the AFL with 1023 rushing yards. Bob Trumpy was the team’s leading receiver, with 37 catches for 639 yards and three TDs.